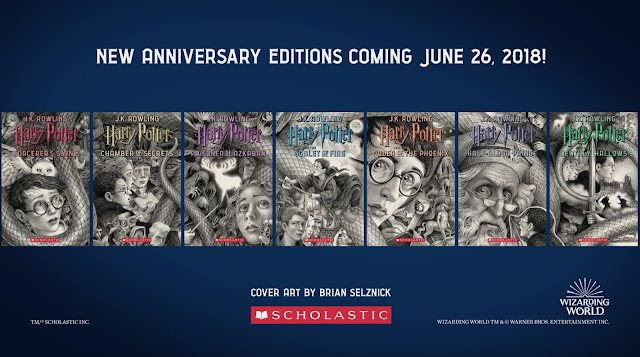 To mark the 20th anniversary of Harry Potter and the Sorcerer’s Stone, Scholastic is planning major events throughout the year including celebrations at bookstores, libraries, schools, and festivals around the country. 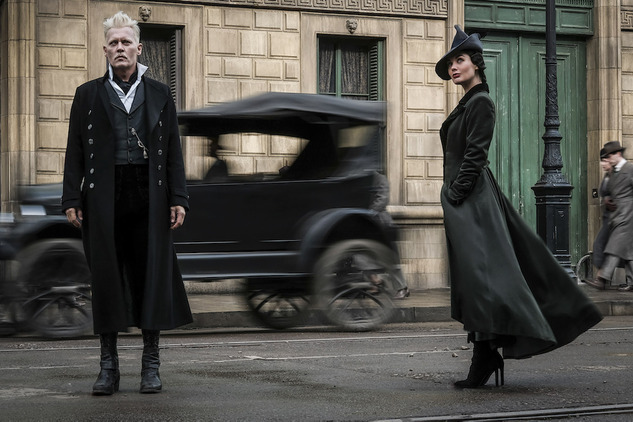 The Wizarding World will have one of its busiest years ever in the U.S. with the stage play Harry Potter and the Cursed Child coming to Broadway on April 22nd; the British Library’s exhibition Harry Potter: A History of Magic opening at the New-York Historical Society on October 5th; and the film Fantastic Beasts: The Crimes of Grindelwald, opening in theaters on November 16th. Scholastic, the global children's publishing, education and media company, today unveiled new covers for J.K. Rowling's Harry Potter series as part of its year-long campaign to celebrate the 20th anniversary of the U.S. publication of Harry Potter and the Sorcerer's Stone. Illustrated by worldwide bestselling author and Caldecott Medal-winning artist Brian Selznick, the new paperback editions will be published in the U.S. on June 26, 2018. Rendered in Selznick's stunning signature black-and-white style with jewel-toned type, the seven covers depict thrilling moments and beloved characters from across the series, including Harry Potter, Hermione Granger, Ron Weasley, Albus Dumbledore, and many more. When placed side by side, the covers form a dazzling single image that tells the overarching story that begins with Harry's arrival at Number Four, Privet Drive, through the epic conclusion of the Battle of Hogwarts. Sharp-eyed readers will spot intricate details throughout the artwork, such as Hermione's Time-Turner, Harry's Patronus, the maze from the Triwizard Tournament, and the Hogwarts Express steaming toward a new school year with the next generation on board. Best known for his dramatic hand-drawn illustrations in his award-winning novel The Invention of Hugo Cabret, Brian Selznick said, "I'm a huge Harry Potter fan (a proud Hufflepuff!) and to be asked to illustrate the 20th anniversary edition covers was an absolute honor. I knew this project came with so much responsibility to the stories, as well as to the readers. I revisited the books and was especially moved by the relationships between the characters in J.K. Rowling's magical world, so I wanted these covers to reflect that. One of the most challenging and rewarding aspects of the process was drawing seven independent covers that would stand on their own, while making sure that they also lined up to create one single satisfying image. It took dozens and dozens of sketches to get it right, and I am thrilled to share my great love for the books with these new illustrations." Scholastic published Harry Potter and the Sorcerer's Stone in the U.S. in September 1998 under its Arthur A. Levine Books imprint with an initial print run of 50,000 copies. To date, the Harry Potter series has sold more than 180 million copies in the U.S. alone, and over 500 million copies worldwide. The books are published in over 200 territories in 80 languages and have been made into eight blockbuster films. ⏩ To mark the 20th anniversary of Harry Potter and the Sorcerer's Stone, Scholastic is planning major events throughout the year including celebrations at bookstores, libraries, schools, and festivals around the country. The Wizarding World will have one of its busiest years ever in the U.S. with the stage play Harry Potter and the Cursed Child coming to Broadway on April 22nd; the British Library's exhibition Harry Potter: A History of Magic opening at the New-York Historical Society on October 5th; and the film Fantastic Beasts: The Crimes of Grindelwald, opening in theaters on November 16th. In addition to the newly-designed Harry Potter anniversary editions releasing this summer, with a collectible boxed set designed by Selznick to follow in September, Scholastic will also publish J.K. Rowling's original screenplay for Fantastic Beasts: The Crimes of Grindelwald in conjunction with the release of the film, as well as books tied to the New-York Historical Society exhibition. Arthur Levine, the publisher of Arthur A. Levine Books says, "Twenty years ago we introduced American readers to J.K. Rowling's Harry Potter series, and for this anniversary moment we want to celebrate just how vital and relevant her storytelling is still today. The wonder of Brian Selznick's new cover interpretations is that he makes us see these beloved characters as if we're just meeting them – and indeed we hope a new generation does exactly that." J.K. Rowling has also written three companion volumes in aid of charity: Quidditch Through the Ages and Fantastic Beasts and Where to Find Them (in aid of Comic Relief and Lumos), and The Tales of Beedle the Bard (in aid of Lumos). In 2012, J.K. Rowling's digital company and digital publisher Pottermore was launched, a place where fans can enjoy the latest news from across the wizarding world, features and original writing by J.K. Rowling. Brian Selznick is the Caldecott Medal-winning creator of the #1 New York Timesbestsellers The Invention of Hugo Cabret, adapted into Martin Scorsese's Oscar-winning movie Hugo, and Wonderstruck, adapted by celebrated filmmaker Todd Haynes, with a screenplay by Selznick; as well as The Marvels. His books have garnered countless accolades worldwide, and have been translated into more than 35 languages.